During his hiatus, Usher went off and built a family. He married an older woman, Tameka Foster, who was a mother of three. 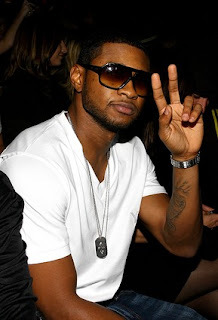 Despite warnings from his mother, Usher still married her and gave her two more sons. After a two-year marriage, Usher had enough of her and prepared his divorce, which led to the song, "Papers." Ever since the couple divorced, Usher has been back in the eye of the public. The release of Raymond v. Raymond made him the biggest name in R&B again. Now that he is back in rotation, the gossip magazines and websites have had a field day. Earlier this year, the questions about Tamkea came and Usher handled them easily. Tameka Foster also spoke about her relationship with Usher and she said it was great mainly due to the children. Foster went on to state both of her childrens' fathers have great relationships with her and with each other. The most important thing to the adults in the childrens' lives is that they have a stable family life. Often, all eight of them are together having family events. Even through everything that has happened, Usher and Tameka have remained as friends.